SERIES RSM Room Status Monitor is designed for critical low differential pressure applications that require stringent pressure monitoring and alarming. The Series RSM can be configured to monitor positive or negative pressure in protected environments and hospital isolation rooms per CDC guidelines. The RSM is a complete system with a graphic user interface which enables access to pressure, security, calibration, and alarm setup. The RSM has a NEMA 1 (IP20) rated fire retardant plastic for indoor applications. Air or nonconductive, nonexplosive gases. 32 to 120°F (0 to 50°C). 5 to 95% relative humidity (non-condensing). ±0.03% FS/ °F (± 0.05% FS/ °C). ±15 in w.c. (±3.7 kPa). Order Code A (24 VAC): 18-32 VAC, 50-60 Hz. Order Code B (120 VAC): 85-265 VAC, 50-60 Hz. Main supply voltage fluctuations up to 10%. Selectable 4-20 mA (2-wire), 0-5 VDC (3-wire), or 0-10 VDC (3-wire). Barbed fittings for 3/16" ID tubing. NEMA 1 (IP20) rated for indoor applications. Mount to standard double gang metal electrical box using 4x4" plaster ring adapter. 8" H x 5.4" W x 1.8" D (20.3 H x 13.7 W x 4.1 D cm). Note: For optional BACnet communication change end from -A to -C for 24 VAC power or from -B to -D for 120 VAC power models. 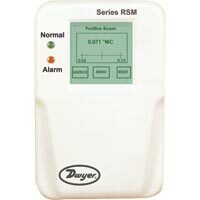 EXAMPLE RSM 1 A Series RSM-1-A Room Status Monitor, range ±0.05" w.c., 24 VAC/4-20 mA or 0-5 VDC.